Colyer Hereford Sire: CL 1 Domino 212M is a Hereford Sire of Distinction and foundation herd sire. 212M was an outstanding individual with loads of natural thickness, muscle, and pigment. His dam is a donor cow with a perfect udder and a pure milk EPD of +19. She also has an average yearling ratio of 111 on three calves. Numerous daughters in the herd. 212M has outstanding carcass EPD's that ranked him in the top 20% of the breed in both rib eye area and IMF. He is an excellent performing bull with a 4 lb. average daily gain and an adjusted 365 day weight of 1357 lbs. 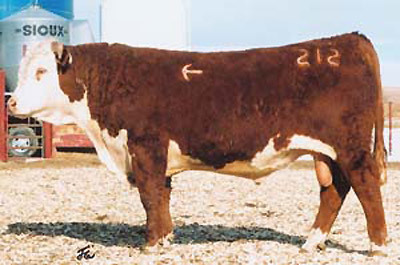 212M was the top selling bull at Cooper Herefords 2003 sale at $54,000 for 3/4 interest.